Hamilton DECA members compete at International Career Development Confrerence - Hamilton School District. 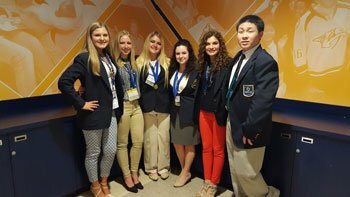 Six Hamilton High School students competed April 23-26 at the DECA International Career Development Conference in Nashville, Tenn.
Carolyn Troutman, apparel and accessories marketing, and Mackenzie Jene, quick serve restaurant management, earned the right to compete at the international competition by placing at district and state level events earlier in the year. Andrew Tai attended the Ignite Leadership Academy part of the DECA Emerging Leader Series. The team of Kayla Muckerheide, Miranda Gammon and Julia Gahr were event finalists in the School Based Enterprises category. Hay were among 10,000 DECA members from 50 states and Canada who attended the conference. DECA student members take part in regional and state competitions designed to simulate real-life business scenarios and test students’ academic understanding and skills development. The top state winners put their talents to the test during the program’s final round of competition in Nashville. DECA prepares emerging leaders and entrepreneurs for careers in marketing, finance, hospitality and management. DECA enhances the preparation for college and careers by providing co-curricular programs that integrate into classroom instruction, apply learning, connect to business and promote competition.